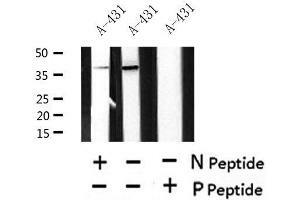 Western blot analysis of Phospho-MERIT40 (Ser29) in lysates of A-431?, using Phospho-MERIT40 (Ser29) Antibody(ABIN6268203). Description: Component of the BRCA1-A complex, a complex that specifically recognizes 'Lys-63'-linked ubiquitinated histones H2A and H2AX at DNA lesions sites, leading to target the BRCA1-BARD1 heterodimer to sites of DNA damage at double-strand breaks (DSBs). The BRCA1-A complex also possesses deubiquitinase activity that specifically removes 'Lys-63'-linked ubiquitin on histones H2A and H2AX. In the BRCA1-A complex, it is required for the complex integrity and its localization at DSBs. Component of the BRISC complex, a multiprotein complex that specifically cleaves 'Lys-63'-linked ubiquitin in various substrates (PubMed:24075985, PubMed:26195665). In these 2 complexes, it is probably required to maintain the stability of BABAM2 and help the 'Lys-63'-linked deubiquitinase activity mediated by BRCC3/BRCC36 component. The BRISC complex is required for normal mitotic spindle assembly and microtubule attachment to kinetochores via its role in deubiquitinating NUMA1 (PubMed:26195665). Plays a role in interferon signaling via its role in the deubiquitination of the interferon receptor IFNAR1, deubiquitination increases IFNAR1 activity by enhancing its stability and cell surface expression (PubMed:24075985). Down-regulates the response to bacterial lipopolysaccharide (LPS) via its role in IFNAR1 deubiquitination (PubMed:24075985).